US singer songwriter Lana Del Rey tweeted confirmation on 7 January 2018 that there was a "lawsuit" against her song Get Free on behalf of Radiohead's song Creep, giving details of negotiations around a share of publishing royalties. What makes this more interesting is that Creep was itself the subject of litigation in the 1990s from the two composers of The Hollies' 1974 hit The Air That I Breathe and their publisher Rondor Music. That case was settled - Hammond and Hazlewood now enjoy a royalty share and writer credit on Creep. For Lost in Music's summary of that case, please see here. Radiohead's publishers challenged Get Free in August 2017. Initially it was claimed by Lana Del Rey via Twitter (now deleted) that their publishers were requesting 100% of the royalties from Get Free, but that suggestion was denied by Warner/Chappell on 10th January 2018, saying "we've been in discussions since August of last year  with Lana De Rey's representatives. It's clear that the verses of Get Free use musical elements found in the verses of Creep; and we've requested that this be acknowledged in favour of all writers of Creep. To set the record straight, no lawsuit has been issued and Radiohead have not said they 'will only accept 100% of the publishing of Get Free". It was reported in Consequence Of Sound that Del Rey claimed on Twitter that she "offered up to 40 [per cent] over the last few months but they will only accept 100. Their lawyers have been relentless, so we will deal with it in court." Two months later Del Rey said on stage in Brazil that the lawsuit was over, though no further details have emerged of a settlement. The Guardian reported the settlement on 26 March 2018. The audio clip below is from two Lana Del Rey concerts in 2018: You can hear Lana Del Rey's live statements here. Get Free was co-written by Lana Del Ray under her real name of Elizabeth Grant. Creep and Get Free share the same unusual chord sequence, which is also heard in the verse of The Air That I Breathe. In the key of C major the chords are C, E, F, F minor. The second chord, E, is the standout, unusual chord, rarely used immediately following the tonic key. Typically a chord of F or G would follow C major, or sometimes A minor or E minor. E major is unusual because it contains the note G sharp as its third note, and this is not heard in C major. The effect is one of surprise. Sharing a chord sequence, even an unusual one, would not in itself infringe copyright, but Get Free also has similar melody shapes to Creep. Its first two lines, "this is my commitment, my modern manifesto" follows the same notes, though not exactly the same rhythms as the start of the chorus of Creep, "but I'm a creep, I'm a weirdo". There are also mirrors of the rhythmic shape in the second line of Get Free, "I'm doing it for all of us, who never got the chance", with Creep's "I wish I was special" line. Although the songs do share a chord sequence, this is not in itself copyrightable. Many elements of the songs are quite unrelated, the lyrics bear no similarity, and the songs are in different keys. Two audio extracts from each song are offered below, illustrating respectively similarities between the verses and choruses of both songs. The verses appear first, in this box, and the choruses lower down the page, immediately above the scores. 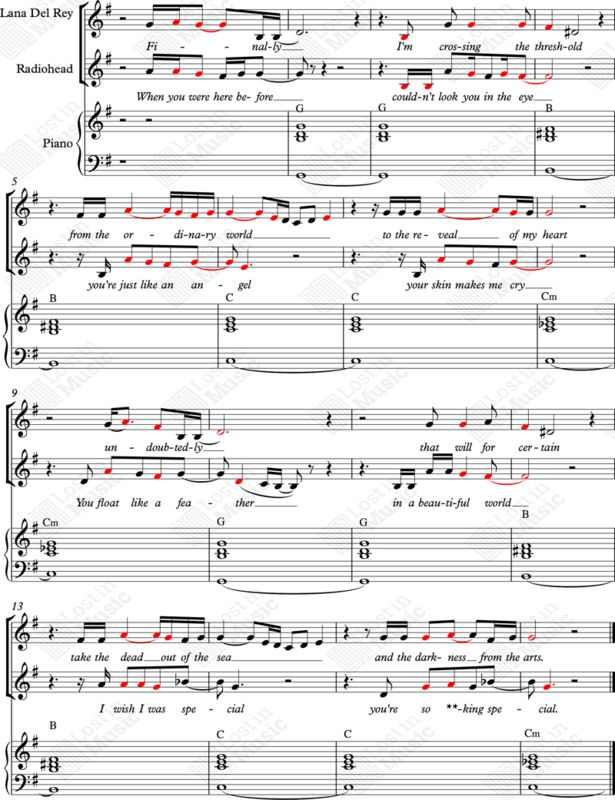 The right hand score below shows a juxtaposition of the melodies of the choruses of both songs. 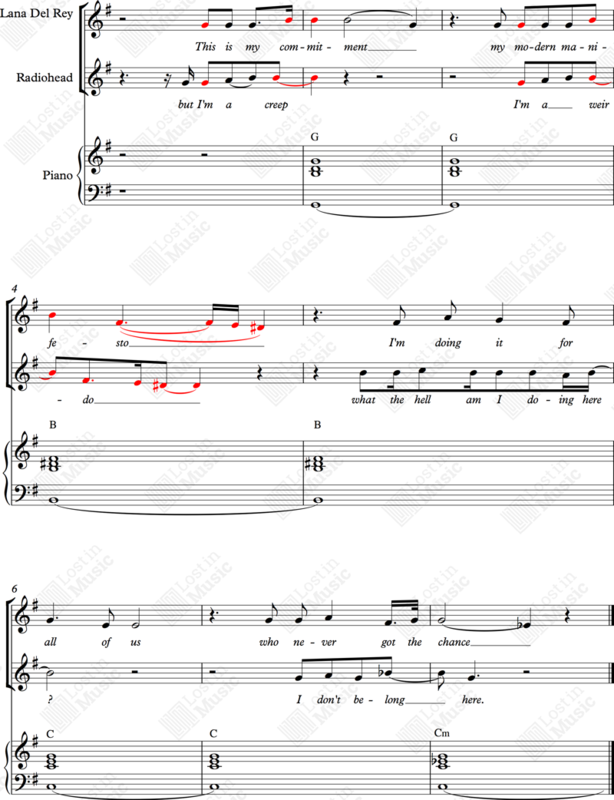 Get Free is recorded in a higher key, Bb major, which causes the songs to sound less similar, though the music has been transposed here down to G major, to match that of Creep. (Selway/Yorke/O'Brien/Greenwood/ Greenwood/Hammond/Hazlewood) Ⓒ Warner Chappell Music Ltd/Imagem Songs Limited. Recording by Radiohead ℗ 1992, Parlophone Records. (Nowels/Grant/Menzies) Ⓒ EMI Music Publishing Ltd/Cosmic Lime (ASCAP). Recording by Lana Del Rey ℗ Polydor/Interscope Records. Score transposed here down from Bb to G major to aid comparison. Tell us what you think. You can register with Lost in Music and vote at the bottom of the Musical Evidence tab, or add comments to the bottom of the page. The Quietus article from January 2018 by Lost in Music's Guy Osborne and Simon Anderson, comparing the links between Get Free, Creep and The Air That I Breathe. New Yorker article by Amanda Petrusich on the case, and the "difficulty of making original music". Guardian article 10 January 2018 quoting Warner Chappell as saying there was no suit, only a discussion. Creep page from Albert Hammond's web site giving details of the 1990s legal action against Radiohead. Analysis of Creep and Get Free similarities by composer Ed Newton-Rex from The Guardian. The Quietus report from March 2018 that the case was over. They do sound creep-ily similar (pun intended). Put the crashing guitar sounds from Creep on Get Free and you'd think it was Creep.